No, of course I’m not talking about President Schill’s decision to discipline Law Profressor Nancy Shurtz. Johnson Hall doesn’t make mistakes. … I, of course, am not arguing that free speech on campus is absolute. Campuses can punish speech that is incitement to illegal activity or that threatens or directly harasses others. Campuses also can engage in more speech, which long has been recognized as the best response to the speech we don’t like. There can be efforts to educate the community about the history of blackface. There should be debates about whether it is ever appropriate to use blackface even when advocating against racism in higher education. Which should end things right there – but instead he’s going to appoint another committee. Professor Jarrar’s conduct was insensitive, inappropriate and an embarrassment to the university. I know her comments have angered many in our community and impacted our students. Let me be clear, on campus and whenever we are representing the university, I expect all of us to engage in respectful dialogue. Immediately following Professor Jarrar’s tweets last Tuesday, we carefully reviewed the facts and consulted with CSU counsel to determine whether we could take disciplinary action. After completing this process, we have concluded that Professor Jarrar did not violate any CSU or university policies and that she was acting in a private capacity and speaking about a public matter on her personal Twitter account. Her comments, although disgraceful, are protected free speech under the First Amendment of the U.S. Constitution. UO President Schill took a less courageous approach to the Shurtz incident, dropping the problem on Interim Provost Scott Coltrane. Coltrane quickly passed to GC Kevin Reed. Reed then passed the problem, and ~$30K bucks, to an outside law firm whose weasley response is linked to below. Professor _____’s comments/costume/billboard/fart/paper/art exhibit/concerto/regression coefficients/blog etc., although disgraceful, are protected free speech under the First Amendment of the U.S. Constitution. Once again The Register-Guard has chosen sensationalism over accuracy, this time in its April 13 story on my private Halloween party of 2016 and my planned return to the classroom. I sought to raise awareness of racism in higher education and the lack of diversity in the medical profession. Some who were not at the party but heard about it have expressed harm. Although I intended no harm, I have offered (and again offer) my profound and sincere apology. I have learned much in this process. However, the stories continue to misrepresent both the facts and the law — as has the university itself. The so-called “investigative report,” prepared by a law firm commissioned by the UO obviously to reach a predetermined conclusion, was wrong on both facts and law — a matter of some concern in a university with a prominent law school. Normally, faculty discipline would not be public information, but since the UO chose to violate that rule and publicize this, I now feel compelled to end my silence and justified in doing so. I did not require students to attend my Halloween party, most students did not attend, and under the law school’s blind grading system I would be unable to reward or penalize students for attending. The report ignores the role of the university and law school administration in misrepresenting the event and stirring the pot, apparently for personal benefit of those doing the misrepresenting. Even the report admitted that I had no ill intent to harm or harass, yet it took the position that punishment can be meted out regardless. The report ignored my long career at the law school as a champion of diversity, perhaps because I have been among the most critical voices of the law school and university administrations on that front over time. The report said nothing about the honor for which I am most proud: my nomination for the university-wide MLK Award in 2012 for contributions, beyond typical job expectations, that uphold and exemplify the ideals supported by Martin Luther King Jr. The report also is wrong on the law: Under the university’s discrimination and harassment policies and under the law, only intentional discrimination and harassment can result in punishment, yet even the report acknowledges I had no such discriminatory intent. Under university policy and federal law, punishable harassment occurs only if a person intentionally targets a specific individual (a student, faculty or staff member, etc.). As the report concedes, my expressions against racism did no such thing. Furthermore, the report completely ignores the Oregon Constitution’s free-speech guarantee, which is more expansive than the U.S. Constitution’s. On the federal free-speech guarantee, the report ignores controlling 9th Circuit Court of Appeals precedents and relies instead on older, questionable precedents from the 6th Circuit (covering Kentucky, Michigan, Ohio and Tennessee) and other inapplicable law. Lastly, the report misinterprets the university’s freedom of speech policy and altogether omits analysis of the university’s academic freedom policy. In short, the report is wrong on the facts and wrong on the law, basically an exercise to justify the previous law school administration’s and university’s rush to judge and punish me. Scapegoating me for the institution’s long history of racial tension and institutional failure is no way to solve the real problems that exist at the university. I will return to campus to live and teach the principles I believe are important in law and education: diversity and inclusion, accompanied by freedom of expression, due process, equal protection, impartial application of the law, and the use of the law to reveal the truth and dispense its direct byproduct — justice. Nancy Shurtz holds the Bernard Kliks Chair at the University of Oregon School of Law. In an admirable demonstration of transparency she even had the Law School post it on their official twitter feed – although no photo of the wickedly funny (black) student who showed up in whiteface. This is in reverse chronological order, so start at the bottom. Comment from Student: A lot of our frustrations are with Prof. Shurtz, who isn’t even here. Precedent in this matter doesn’t set a clear path for preventing a similar incident in the future, (return to faculty, take sabbatical, etc.). Comment from Student (3L in Portland, Pres. BLSA): The administration did not contact the Black Law Students Association after receiving 30 emails last year about this incident from the Dean. Comment from @UOsojc Student: What does diversity and inclusion mean to this law school community when the professor may not even understand the ramifications of her actions? Comment from Student: This professor is not held accountable to students. She isn’t here and should be here. Comment from Student: It’s not just that she’s coming back. It’s that she’s teaching a class that I would have to set aside my identity to attend. “I agree with about 93% of what you’ve said. The time is now,” @Marcilynn_Burke Training for professors is part of our Diversity Action Plan and starts this summer. But, there is a lot of work to be done. Most cannot be done overnight, but it is being done. Statement from Student: I am really disappointed that change is not taking place now. I have had to explain environmental racism to other students and faculty. We need to make change now. Comment from Student: As a white person (1L), I am not as affected by the action Prof. Shurtz took as my colleagues of color, but I am disgusted by it. Q4: Please, @Marcilynn_Burke say what the incident was. A4. “Prof. Shurtz wore blackface at a party in her home.” Questioner: The decision to apply makeup and a wig takes time and intention and planning. Others can intervene. A3: @Marcilynn_Burke I am familiar with the opinions Prof. Shurtz has made in the press. Q3: Has Prof. Shurtz been educated about the difference between Blackface and cultural appropriation? A1. @Marcilynn_Burke The decision predates me and was made by the Provost before Prov. Banavar. What students have told me is that we (#OregonLaw) are more than 1 incident. Q1: You mentioned things about what defines Oregon Law, maybe to US News or law firms, but you also mentioned community. Does having [Prof. Shurtz] back in the classroom defining our community in a way we want? Dean @Marcilynn_Burke discusses her decision to come to #UOLaw. “People are talking about the students, faculty, and staff and the great things we do in the world.” I came here knowing there was an ugly incident, too, but it did not stop me from wanting to be your Dean. “I have been told that we are much more than a traditional Law School, with more than a JD and LLM. We also have a #CRES Master’s degree program and an undergraduate program.” Within the context of a big research university, it means we can address the complexity of our world. Today’s #UOLawTownHall is set to begin. Thanks, all for coming out! The Government may not insulate a law from charges of viewpoint discrimination by tying censorship to the reaction of the speaker’s audience. The Court has suggested that viewpoint discrimination occurs when the government intends to suppress a speaker’s beliefs … but viewpoint discrimination need not take that form in every instance. The danger of viewpoint discrimination is that the government is attempting to remove certain ideas or perspectives from a broader debate. That danger is all the greater if the ideas or perspectives are ones a particular audience might think offensive, at least at first hearing. … In evaluating the event in light of the University’s policies against discrimination, it is important to outline the outcomes and impacts following the event, upon both the attendees as well as the student body. As stated previously, different guests had differing personal perspectives, so the range of responses varied accordingly. One point that was clear, at least before the event, was that most of the attendees knew Shurtz (setting aside the family members and plus-ones), had an appreciation for or understanding of her personality and her general intentions, and held her in esteem. 1. That Nancy Shurtz’s wearing of the costume at the stated event constitutes a violation of the University’s policies against discrimination. We further find that the actions constitute Discriminatory Harassment under those policies. 2. That the actual disruption and harm to the University resulting from Nancy Shurtz’s wearing of the costume at the stated event are significant enough to outweigh Nancy Shurtz’s interests in academic freedom and free speech. Is free speech on campus dying? If so, it’s still kicking. Friday’s engaging talk by Geoffrey Stone from Chicago Law laid out and put to rest the arguments against free speech and academic freedom one by one, then finished them off with his responses to audience questions about the increasing use of hate speech by conservatives, and safe spaces for our increasingly diverse students. As an African-American woman who grew up in the segregated South and has spent the past 30-plus years in liberal Eugene, I’ve heard these messages all of my life — and they are now being played in stereo in letters to the editor regarding the recent blackface incident at the University of Oregon. Well, let me add my two cents’ worth. 1) There are people at the UO experiencing a great deal of pain because of this incident. Understand that pain is not felt on a sliding scale. Only the person experiencing pain, embarrassment and disappointment can determine how much it hurt. Their pain needs to be respected. 2) The fact that life-threatening events are occurring in the world does nothing to alleviate the inappropriateness of a professor with more than 30 years of experience at a respected institution being unaware of the historical use of blackface, yet trying to stimulate a conversation on racial biases..
… 5) The fact that no one told her that her costume was insensitive during the party is understandable. It is common for people to be so shocked by insensitive behavior that they become momentarily speechless, especially if they have not had sufficient experience with confronting such egregious behavior and wish to avoid making a scene or offending a host. … 7) I feel hope when I hear that some of the professor’s guests were able to recognize that the costume was inappropriate and had the will to speak up, and that university administrators heard them. This is the behavior of allies in the fight for racial justice. They should be applauded, not harangued. 8) I am hopeful that the university will use this as an indication that there are probably others who would benefit from diversity training. There are many people in liberal Eugene who cannot see the need for a well-meaning person who “loves everyone the same” to attend such training, but perhaps the professor would not be in this most undesirable position now if she had understood that good intentions don’t always work so well without knowledge and training. Perhaps it is time for the professor and those rallying to her cause to “get over it,” understand that she harmed the institution that employs her, accept the consequences of her actions, realize that there are greater problems in the world and move on with life. Martha Moultry of Eugene is a retired teacher and principal who has worked in the United States, Asia and Africa. Eugene Volokh teaches free speech law, tort law, religious freedom law, church-state relations law, and a First Amendment amicus brief clinic at UCLA School of Law, where he has also often taught copyright law, criminal law, and a seminar on firearms regulation policy. Before coming to UCLA, he clerked for Justice Sandra Day O’Connor on the U.S. Supreme Court and for Judge Alex Kozinski on the U.S. Court of Appeals for the Ninth Circuit. Slate has the latest here. Thanks to a reader for the link. The professor apparently tweeted an obscure reference to Toussaint L’Ouverture. His dean didn’t get the sarcasm, or the First Amendment, so his job is now on the line. The professor’s job that is. Should be an interesting meeting. On Wednesday, Dec. 21, 2016, the University of Oregon improperly released a flawed investigative report into events surrounding a Halloween party that I hosted in my home. This release violated rights of employees to confidentiality guaranteed by law. In addition, the report contains numerous mistakes, errors and omissions that if corrected would have put matters in a different light. For example, it ignored the anonymous grading process, the presence of many non-students as guests, and the deceptive emails that created a firestorm in the law school. I, and my legal advisers, were preparing a response to the draft report. Although the University was aware of our intention to submit our corrections by noon (local time) yesterday and to deal with its errors in-house, the Provost’s office or its advisers cynically decided to try to publicly shame me instead. As the UO’s press release itself notes, the University is prohibited by law from disclosing personnel matters. But the press release and uncorrected Report act as a supremely public retaliation against me for seeking, even if clumsily, to raise issues of insufficient diversity in American professions. My attorney and I are evaluating our legal options. ROCK HILL, S.C., Dec. 19, 2016—A Winthrop University student was found not responsible for violating two university speech codes after her involvement with a campus anti-lynching art installation. This outcome comes six days after the Foundation for Individual Rights in Education (FIRE) and the National Coalition Against Censorship (NCAC) wrote to the university president to ask that the charges be dropped. …. It is a sad testament to the current state of our “free” speech that even writing this letter seems too risky to pen under my own name. Those that would seek to invalidate my stance based on my race and background commit the same offense they decry — invalidation of whole persons based on race – this logical fallacy was once called ad hominem. … My second observation is that the First Amendment is not the only potentially relevant legal constraint. Due process (are faculty clearly told what they cannot say so they are not sandbagged? ), contract law (tenure is often a contract concept), and state constitutional protections may give public faculty members more latitude than does the First Amendment. And these extra protections may be perfectly appropriate if we do take seriously historical notions of academic freedom. My last observation is an important one, and that is that critics of Professor Shurtz have themselves erred. President Schill’s quick characterization of Professor Shurtz’s use of blackface as being “in jest” is at odds with her own explanation, and we need remember that there has been no process yet to determine any actual facts. Shurtz’s 23 faculty colleagues assert that her “intentions [don’t] matter.” But whether we are interpreting the First Amendment or deciding whether someone should be required to give up her very livelihood, intent ought clearly to matter a great deal. After all, the reason (correctly identified by those calling for her resignation) that Shurtz’s actions warrant serious scrutiny is that they may undermine her (and the university’s) trust and credibility with students, alumni and the community. But wouldn’t students, alumni and the outside world want to know why she did what she did in deciding how much less they like and trust her and the law school? If she did it to mock African-Americans (or merely “in jest” because she is flippant about race), aren’t they likely to be much more angry and disaffected than if she did it to support the cause of racial equality (like the author in Black Like Me who feigned blackness to document racism), even if her attempt was clumsy, ill-advised and ultimately counterproductive? Again, no process has yet found the full facts (I have no familiarity with Professor Shurtz and am not vouching for her sincerity). But the idea that intent is irrelevant when heavy consequences like resignation are being considered runs counter to most areas of law and moral intuition. And lawyers – especially law professors who are teaching students how to frame arguments — ought to take care to appreciate that. Update: Administration to start calling faculty to the office. Pres Schill emails campus. I’m still searching for the policy prohibiting offensive stupidity. Should you be called into the AAEO office, you should be aware that Penny Daugherty’s job is to defend the UO administration, not you. Additionally, her staff are unfamiliar with the basics of university policies. If they tell you they just want to have a confidential off-the-record conversation with no repercussions, you’ll have to explain their obligations under UO’s mandatory reporting policy – they don’t understand it, or pretend that they don’t. My advice is get a lawyer and record everything. When Doug Park called me in over my “unlawful” decision to get a digital copy of UO’s Presidential archives I brought two, plus David Cecil from UAUO. Very helpful, especially since Park tried to ambush me by bringing Bill Gary from HLGR. Last week was an incredibly difficult time for our university. The decision of law professor Nancy Shurtz to wear blackface at her Halloween party wounded our community, divided us, and exposed fissures that long existed under the surface. It is now my job as the leader of our school to not only help us heal but, more important, to move us to a demonstrably better place. The challenge for all of us is to recognize that the problem is deep and cannot be fixed with a Band-Aid. Instead, real healing, progress, and transformation will take time, persistence, and generosity of spirit. University presidents are not supposed to get angry. But right now I feel both mad and more than a little sad. Over the past year, we have worked with our African American students and faculty members to make the UO a place where educational opportunity and excellence are accessible to all. We have taken the name of a former leader of the Ku Klux Klan off one of our buildings; we modestly increased the proportion of African American students in our freshman class; we created new pipeline and outreach programs; we launched a new African American studies cluster-hiring initiative; we created a new African American residential community; and we are planning new scholarship programs and testing the feasibility of a new African American cultural center. We also finalized our IDEAL framework, a plan to put in place a culture, processes, and system to promote diversity and inclusion throughout the entire university. I am excited about our progress, and I am not willing to let last week’s events slow our momentum and growth. To the contrary, last week’s events suggest that we need to redouble our efforts to combat racism and ignorance on campus. We need to expand our work beyond students and reach our faculty, staff, and administrators. We must help our community comprehend how racist behavior can be baked into our society so deeply that some of us don’t even recognize it. And we must take actions to transform ourselves and make this school a better place. My first instinct when faced with a problem is to dive in and fix it. But I have to admit, like my counterparts at most American universities, I know of no silver bullet. I do know that I, along with our entire academic leadership, will need to consult with our students and faculty members of color to understand their experiences and hear their ideas. Provost Coltrane and I will ask each dean and vice president to immediately begin conversations within their schools and departments with our faculty members, students, and staff members of color. The IDEAL plan calls on each school to develop plans on an annual basis. I will ask that each school and administrative unit accelerate the process and report back to me in 90 days with a set of steps they plan to take to promote diversity, combat racism in their units, and promote inclusion. I will work with the provost and our Division of Equity and Inclusion to ensure that these steps are taken and their impacts are measured. With respect to the immediate issue of Professor Shurtz, as I announced last Monday, I have referred the matter to our Office of Affirmative Action and Equal Opportunity. That unit, which will be assisted by an outside law firm, will make a determination as to whether Professor Shurtz or anyone else violated any law or university policy. During the pendency of that process, the dean of the School of Law has placed Professor Shurtz on administrative leave to permit the law school’s educational mission to move forward. We will provide Professor Shurtz with all of the procedural rights she is entitled to under the law and university policy. We cannot and should not prejudge that process and speculate about the outcome. And even as we condemn the use of blackface, we must consider that these actions may be protected by the First Amendment and our university’s tradition of academic freedom. While many of us feel that what Professor Shurtz has done is wrong, I also would ask that you leave space in your hearts, words, and actions for forgiveness and compassion. Although we all must be held accountable for our actions, I would also hope that we would ultimately be judged for what we do on our best days as well as our worst. Finally, I am aware that some members of our community have received communications that are hateful, racist, and make them feel unsafe. I have read some of them and they sicken me. I have consulted with UO police chief Matt Carmichael, and we have not been able to find any credible evidence that they emanate from members of our university community. Nevertheless, I have asked the chief to deploy additional personnel both to the investigatory process and to ensuring that every member of our community is physically safe. As we deal with this horrible episode, I ask everyone to take a deep breath and think about how their actions affect other members of the community. This is a time for us to come together to fight ignorance and racism, to promote inclusion. It is not a time to hurt each other, settle scores, or compromise our cherished values of free expression. This is a time for us to come together to make progress and not a time for us to be divided. We must support each other and treat each other with respect. We must give people the room to express their opinions and feelings, even if we disagree with them. We must not shy away from hard conversations or ugly truths, but we will not tolerate hate speech or threats—period. As president, I pledge that UO leaders will do everything we can to provide a safe and supportive campus environment for that to happen. So let’s agree today that we, as a community, are going to use this challenging time as an opportunity to unite behind shared values and a common goal of fighting bigotry and ending prejudice on our campus and in our nation. Let’s agree that one person’s actions do not define the University of Oregon or the progress we are making toward becoming a more welcoming, diverse, and inclusive institution. By uniting as a community, we can move past this moment and become stronger and more resilient. That would be Auburn University. 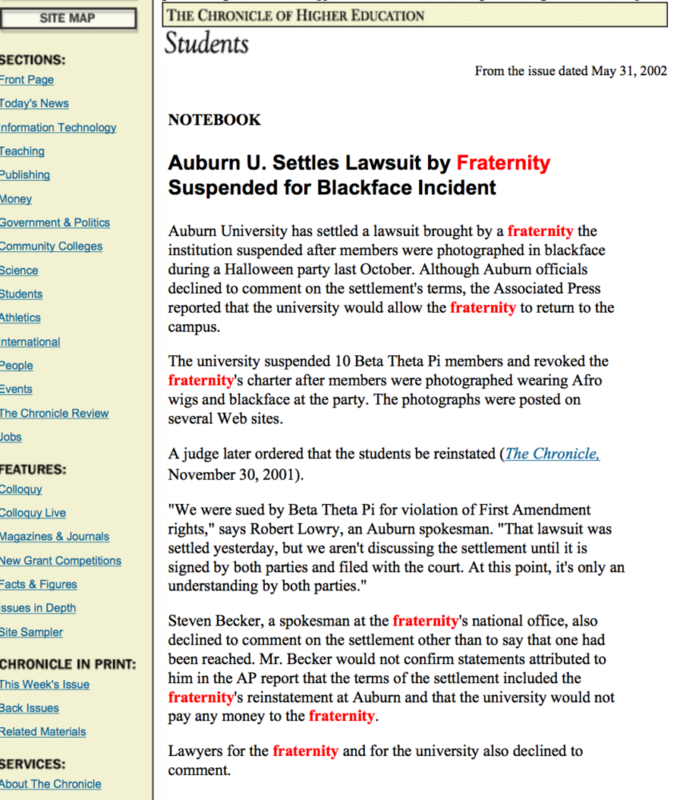 Frat boys, not a law professor, and it was 2002. My uninformed guess is that if Law School Dean Michael Moffitt doesn’t lift Professor Shurtz’s suspension soon and offer a heartfelt apology UO will pay out at least the $800K the Bowl of Dicks cost us – plus billable hours, of course.